and Professor David Oliver, Canterbury, U.K.
Modern palliative care traces its origins to the pioneering work of Dame Cicely Saunders who founded the first modern hospice, St. Christopher’s Hospice, in 1967 in London. Although most patients in St. Christopher’s suffered from cancer (as indeed most patients followed by palliative care teams to this day), a small group of patients did not. From the beginning, a few beds were reserved for patients with amyotrophic lateral sclerosis (ALS). The World Health Organization (WHO) definition of palliative care states that “palliative care is an approach which improves quality of life of patients and their families facing life-threatening illness.”3 There can be little doubt that a large proportion of neurological patients fall into this category.4 Indeed, given the progressive clinical course and the lack of curative options for most neurodegenerative disorders, one would assume that neurological patients and their families would stand to benefit greatly from an integration of the palliative approach into neurological practice. For the first time in the history of the World Congress of Neurology, two sessions on palliative care were held as part of the scientific program in Kyoto. The sessions were organized by Professor Wolfgang Grisold, secretary general of the WFN, and Professor Gian Domenico Borasio, neurologist and chair in palliative medicine at the University of Lausanne in Switzerland. In the second session, which was devoted to clinical examples of neurological palliative care, Professor Monika Führer, of Munich, Germany, showed impressive data on neurological involvement in pediatric palliative care, which turns out to be present and significant in 75 percent of patients.6 Cancer accounts for only about 20 percent of pediatric palliative care patients, further underscoring the importance of neurological palliative care in this context. The sessions were well attended, and the discussants highlighted their own experiences from places as diverse as Australia, Europe, Japan, and Sri Lanka. Common themes were the difficulty to provide adequate palliative care to neurological patients, the lack of evidence-based guidelines, and the challenge of colleagues confusing palliative care with terminal care. 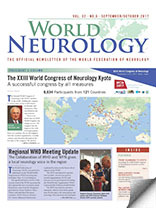 We sincerely hope that future WCN meetings will continue to offer attendees the possibility to hear about the most recent developments for this crucial topic for clinical neurological practice. Oliver D, Borasio GD, Johnston W.(eds) Palliative care in amyotrophic lateral sclerosis: form diagnosis to bereavement. 3rd edition. 2014. Oxford. Oxford University Press. Oliver DJ, Borasio GD, Caraceni A, de Visser M, Grisold W, Lorenzl S, Veronese S, Voltz R. A consensus review on the development of palliative care for patients with chronic and progressive neurological disease. Eur J Neurol 2016;23:30-38.